On the sixth day of their detention, the 43 health workers were visited by lawyers, doctors, the Commission on Human Rights and the Office of Sen. Pia Cayetano. Initial reports say their morale was boosted by the visit. The Department of Justice today also filed cases of illegal possession of fire arms and explosives against the 43 health workers. The case was filed in Morong, Rizal. No bail was recommended. Meanwhile, in what could be the best news so far, the Supreme Court gave due course to the petition for the writ of habeas corpus filed by the families of the victims. A hearing has been set for tomorrow, Friday at 2pm at the Court of Appeals in Manila. The AFP continues to deny that they are subjecting the detainees to torture, calling it instead reasonable restraint. Bayan called on the Arroyo government to comply with the United Nations Convention Against Torture and the Philippines’ own anti-torture law. the Arroyo government has not done anything to address the findings of torture made by the Commission on Human Rights and the Health Alliance for Democracy. The fight is not yet over. 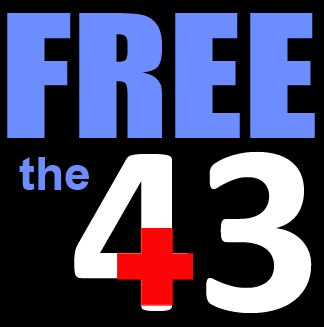 We still need to do all we can, here and abroad, in the courts and in the streets, to free the 43.